In 2016 Christine and Randal invited a group of friends to go to Bali for the Interhash there . Niki Borde saw the opportunity to bring that event to Trinidad and asked the World Interhash Council if that was possible. They were so happy that they dragged her up on stage to make the announcement in front of the 6000 hashers to a huge roar of approval, because this event was always held in the South China Seas. After consulting with the Council they sent her their strict criteria to be met and the guidelines to follow to host the event.. This is a World Interhash Council event. Niki and Christine then met with the POSHHH Committee to show them her interest in hosting the event here in 2020 and asked for their support which they offered enthusiastically . Plan It Productions then invested its time and money to create a a fantastic bid, with an amazing 5 min video , fliers, Jerseys and banners etc to take all the way to Fiji. At the Fiji event Trinidad, Malaysia , Goa, Dubai and New Zealand were all asked to make there presentation to the hashers. After the vote count, Trinidad had WON!! * It was the first time a first time bidder had ever won! * It was the largest voter turn out ever! * Trinidad won by the largest winning margin EVER ! * It was the first time EVER that the Interhash would be coming to the Americas! * And it was ONLY the second time a WOMAN had lead a team that won the bid to host the interhash. The first time was a woman from New Zealand. The TT bid had broken many records. ! It was a very exciting time! Thanks to ALL the Trinis that paid their way down there, worked hard and made it a success!! 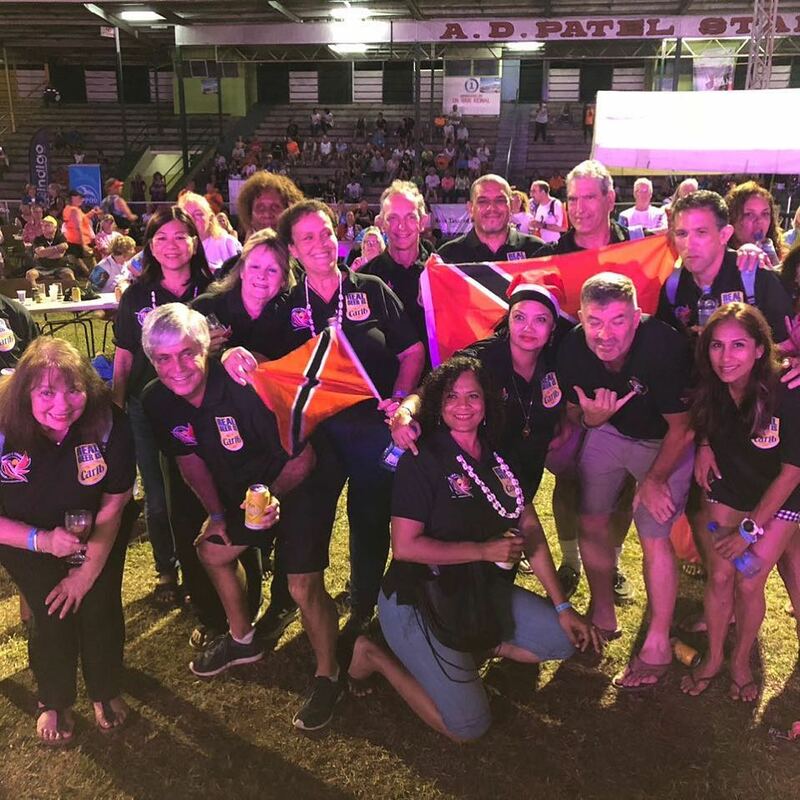 We couldn’t have done it without any of you, especially our hashers who gave their full supoprt, Jenny Jones, Marita and Eric De Silva, Suzan,Mclouglin, Sherri, Tang yuk, Corkie and family, Chris Mawer, Sharmine Nothingham, and the none hashers who went to have fun and were a great help thank you . In September Randal, Niki, Jennifer and Christine went all the way to Kuala Lumpur for the 80th Anniversary of the original Mother Hash . We worked hard at the booth registering hashers there and promoting Trinidad and Tobago and the event to the Asian Market and others. Randal and Jen went on the Hash runs to see how they handled it there. We had a booth with jerseys, fliers, Banners etc . We were able to register 3 groups from Malaysia, Thailand and China and other individuals from USA and Europe. It was a long hard trip to the other side of the world but that’s what we need to do to make this event a success. Red dress run – 542 hashers registered to date. IMPORTANT NOTICE – A special package is being created for LOCAL Hashers that will run from JANUARY 1ST – DECEMBER 31ST 2019. Giving local hashers a full year to register . Stay tuned for that announcement. Niki and Colin Borde have already met with the PTSC and 100 buses are already booked for the event. Logistics to be tied down as run sites are finalized. Sponsors are all coming on board as well as other stakeholders. Colin and Jennifer have been working with Hotels, Guest Houses, Air BNB and private villas on accommodation. Talks are on the way with 2 Major Airlines as well as CAL . Immigrations talks are also on the way. Preliminary talks are already on the way for a PRE and POST LUBE in Tobago. Quotes are coming in from China for goodie items for hashers as well as Jerseys for Hashers, Hares, Volunteers etc. Its only 2 months in to planning but there is a lot going on. As things develop we will be updating all of you here. There will also be opportunities for catering at the run sites but these issues will be dealt with in the upcoming months as we finalise the sites and the numbers of participants. Some of you have expressed interest in volunteering for the event. Please let me know or Jenny Jones and Marita. This is the big event and Niki, Colin, Jen, Randal and I and the rest of the team, would like to thank all of you who have supported us so far and we look forward to all making this event the best Interhash EVER. Let’s do this. A special thanks to the POSHHH team for your support.